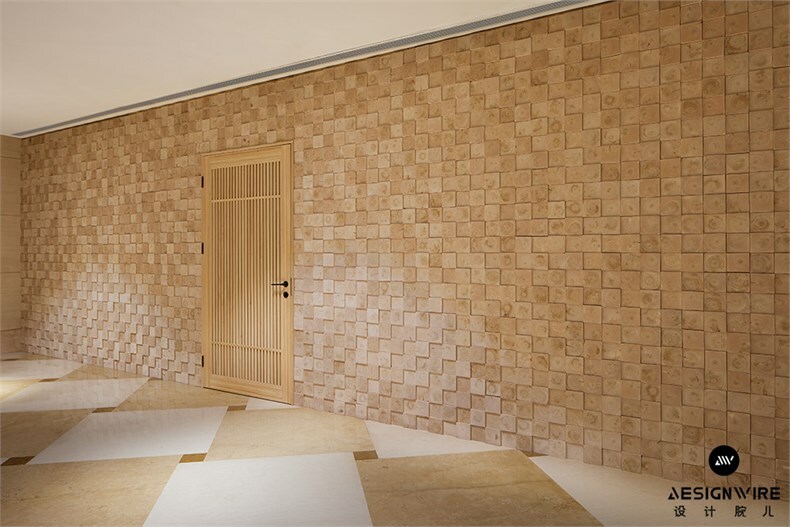 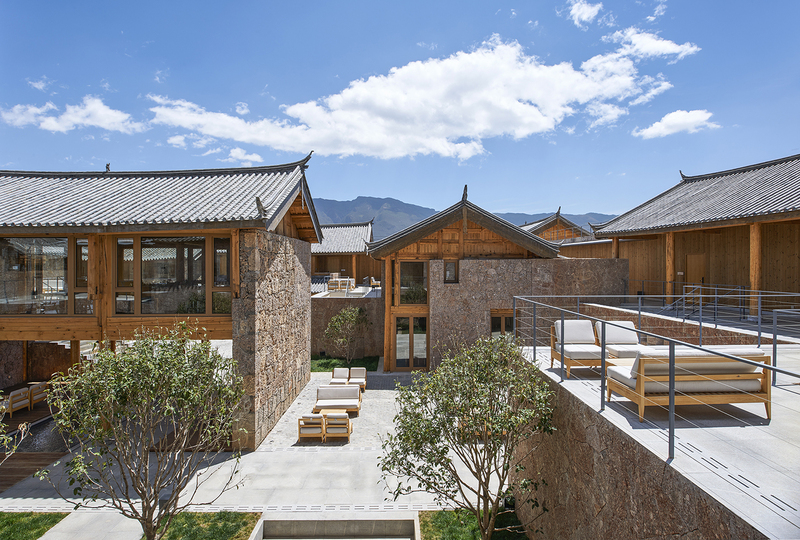 The project is located on the ground floor of Chengdu Shangri-La Hotel with a street frontage. 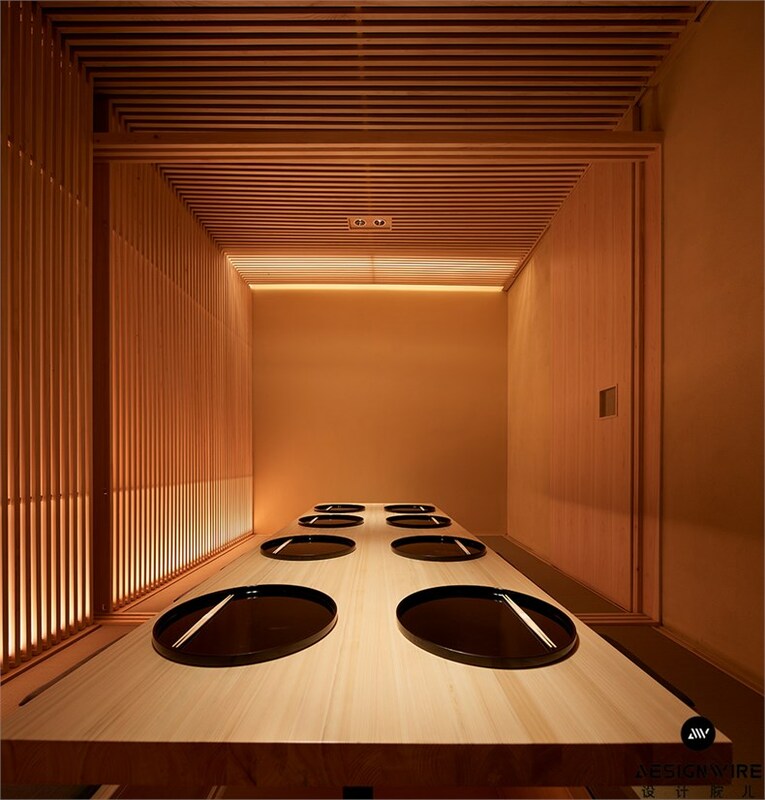 There are two categories with a single kitchen, one is for the Japanese-style barbecue Robatayaki, the other is for Kaiseki which is a traditional Japanese meal brought in courses. 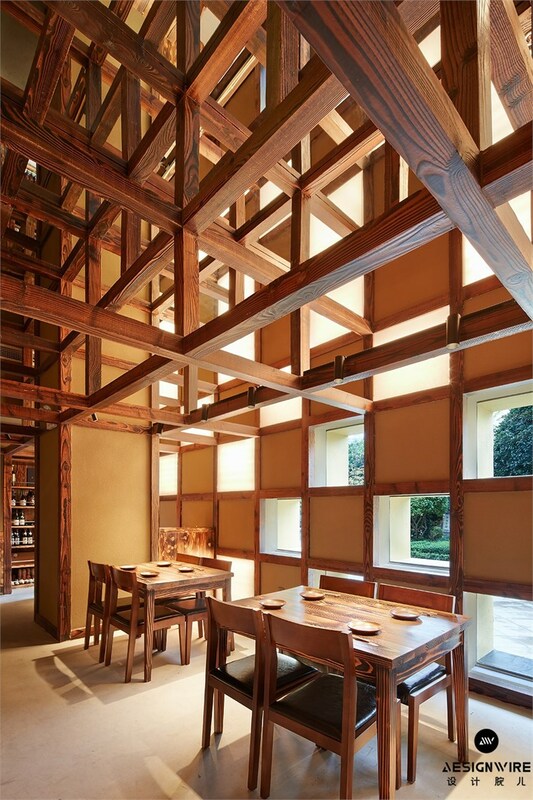 Referring two different traditional typology of Japanese houses, civilian’s house and tea-room of Samurai, we extracted characteristic elements and expanded them multiple-layered, so to create an enduring space without being consumed. 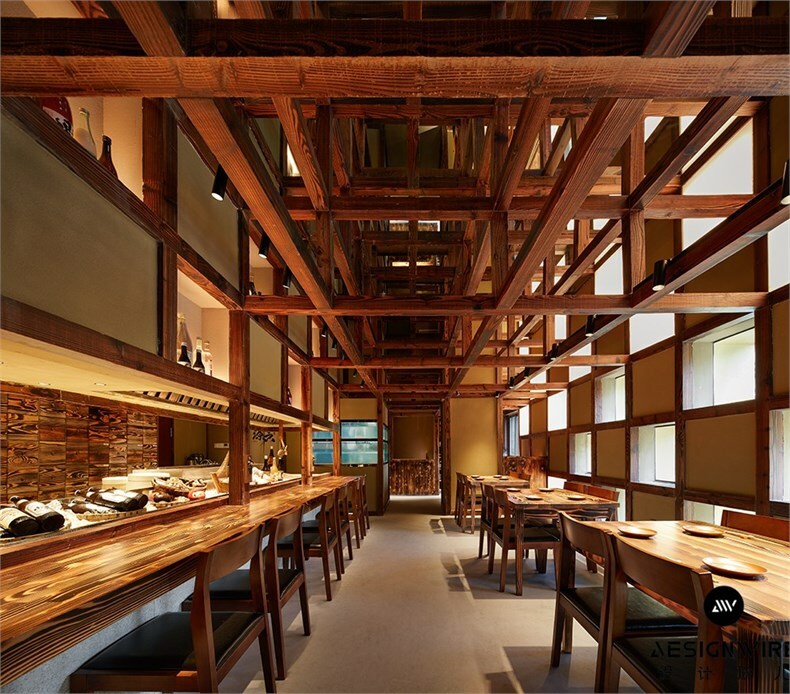 In the part for Robatayaki which is on the lineage of civilian, we referred to Yoshijima House in Gifu which has a dynamic wooden structure. 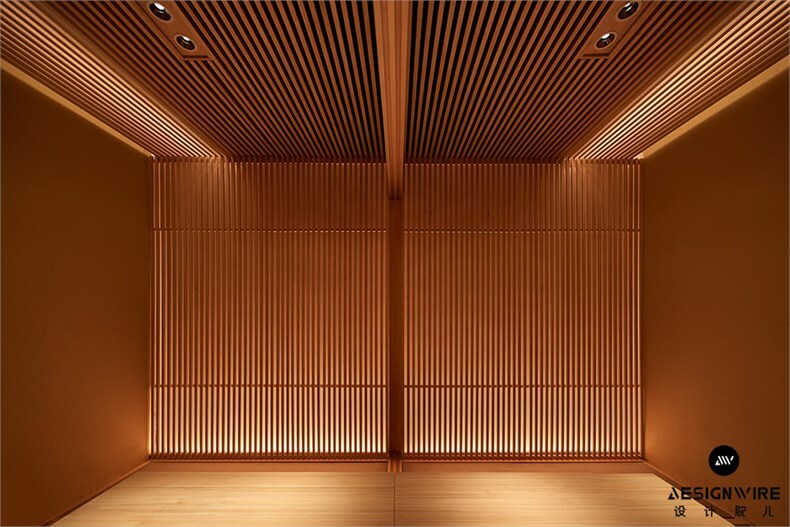 First we installed an aged wooden frame in the utmost height, then put the mirror on the ceiling to show dynamic reflected image with double height wooden structure. 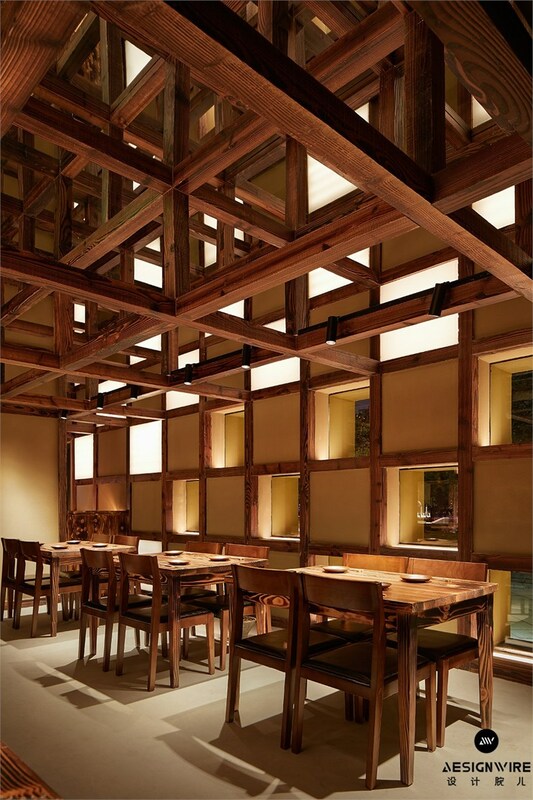 On the wall facing the street, windows and washi light box are set in checkered pattern, and those directional light raise the wooden frame elegantly. 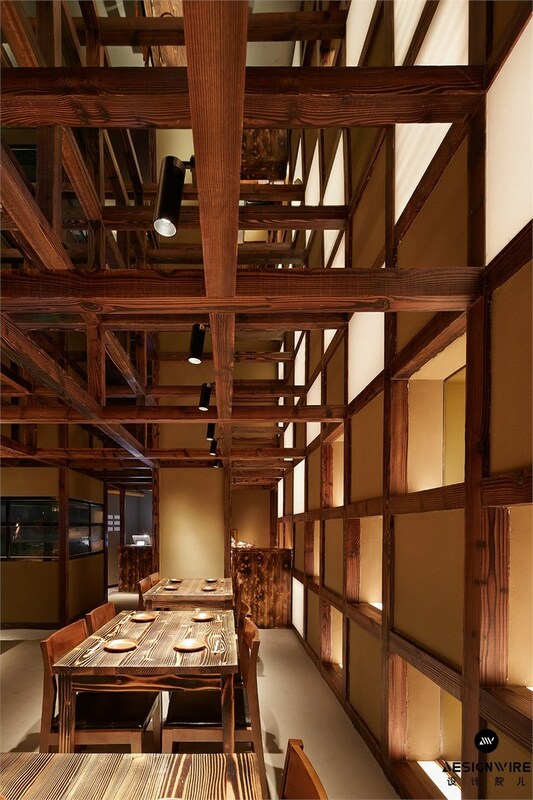 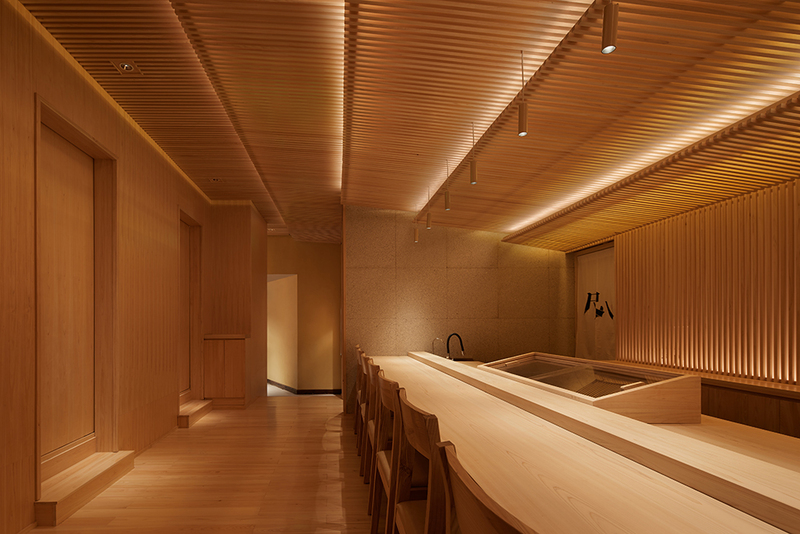 In the part for Kaiseki which is on the lineage of tea-room, we overlapped tilted ceilings that is a typical language of traditional tea-room. 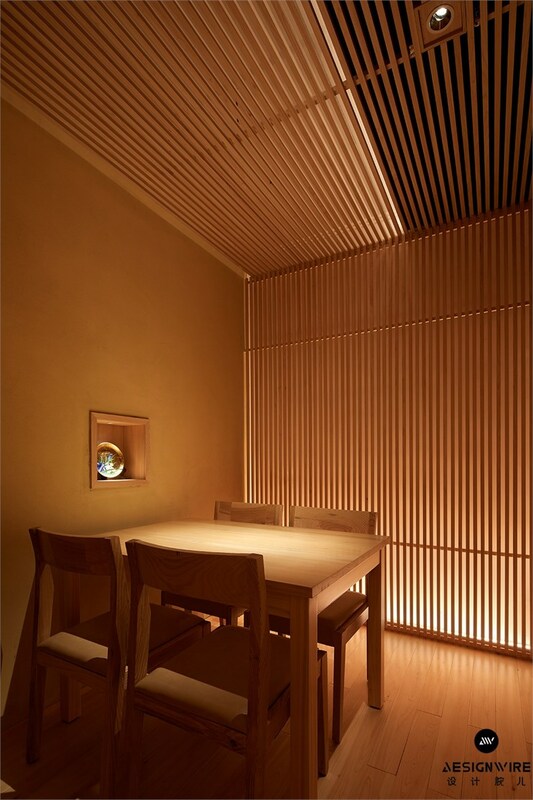 These ceilings made by Sunoko which is a small fine louver panel has different angle each other, and the moire pattern caused by those layering directs extraordinary. 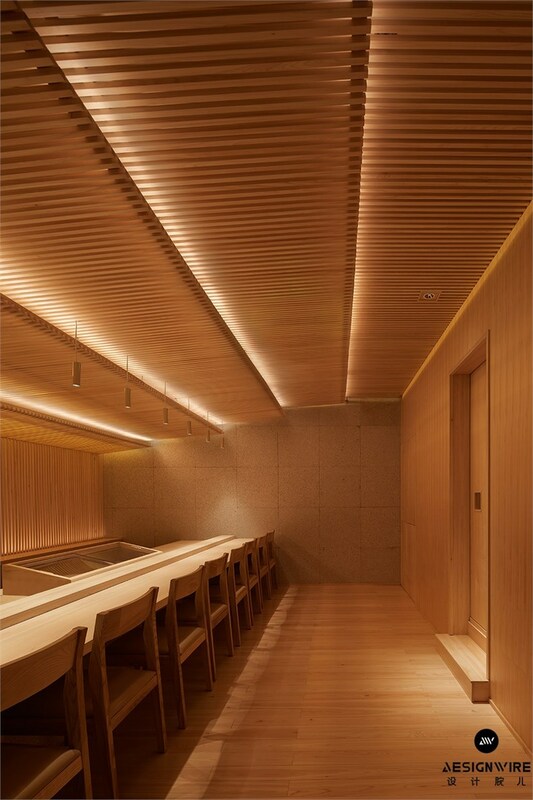 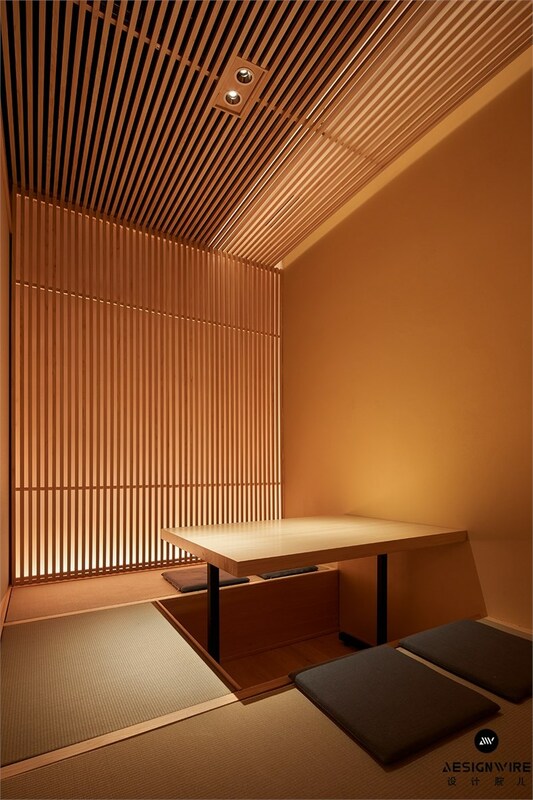 The private rooms also consist of Sunoko elements, and upper light behind the wall and top light on the ceiling makes diversity in the tiny room. 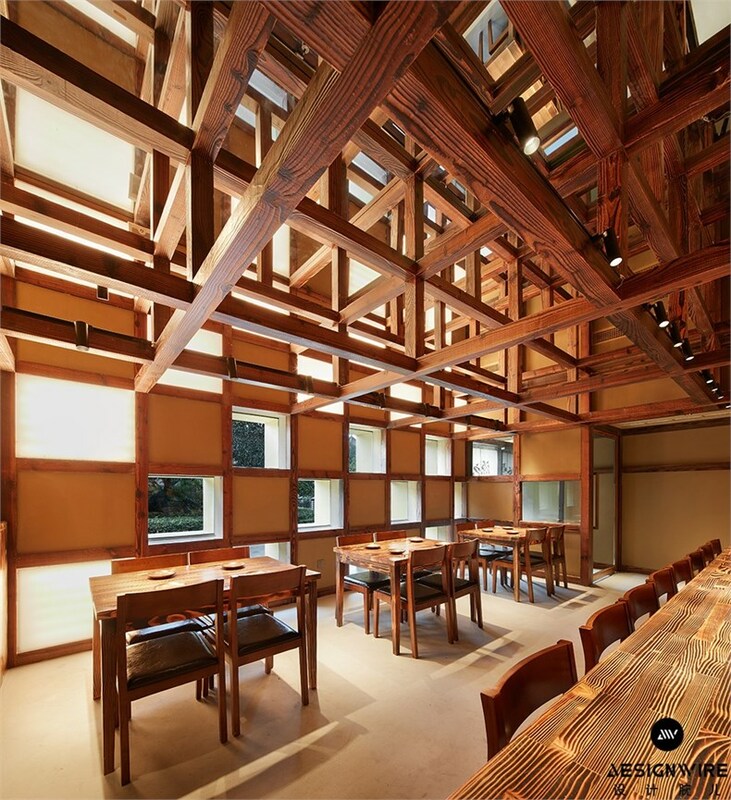 The façade, as Jorn Utzon once said “the characteristic of Japanese architecture is the roofs”, is designed to be like roofs. 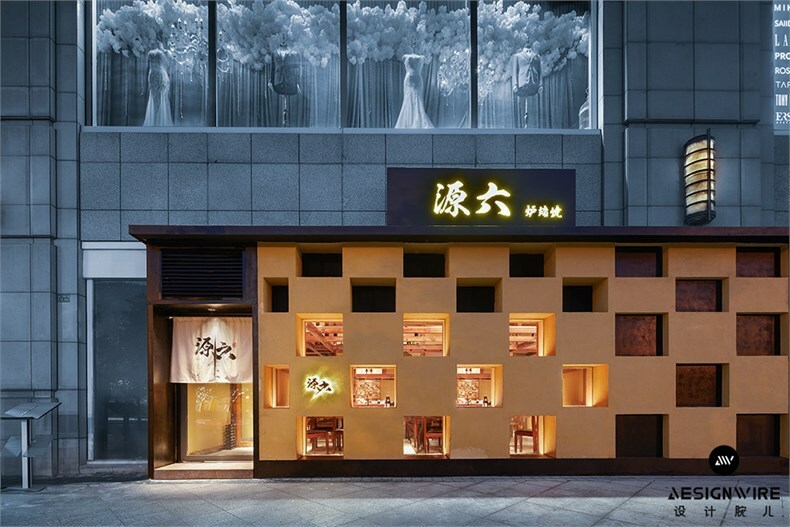 That of Robatayaki should have been defined as thatch, but due to the fire code, it is now painted mud taste with rice straw. 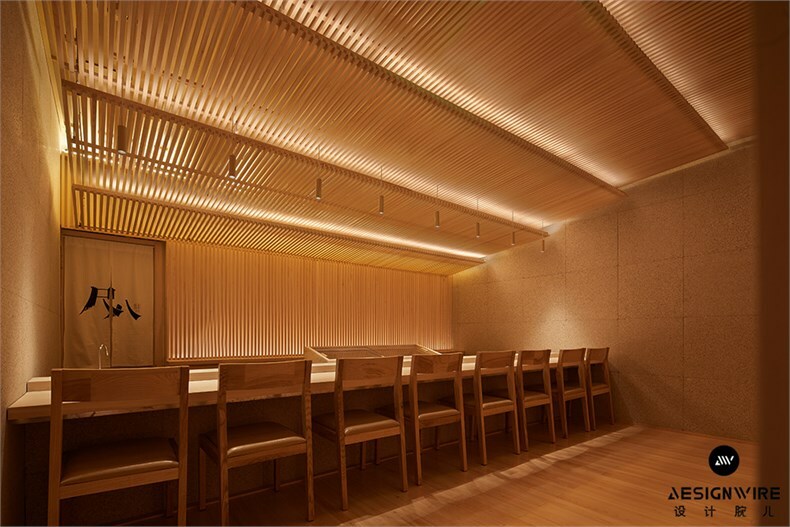 That of Kaiseki is covered with ruffled copper plates which was invented by Fujimori, it will look like a traditional copperware finished by hammers. 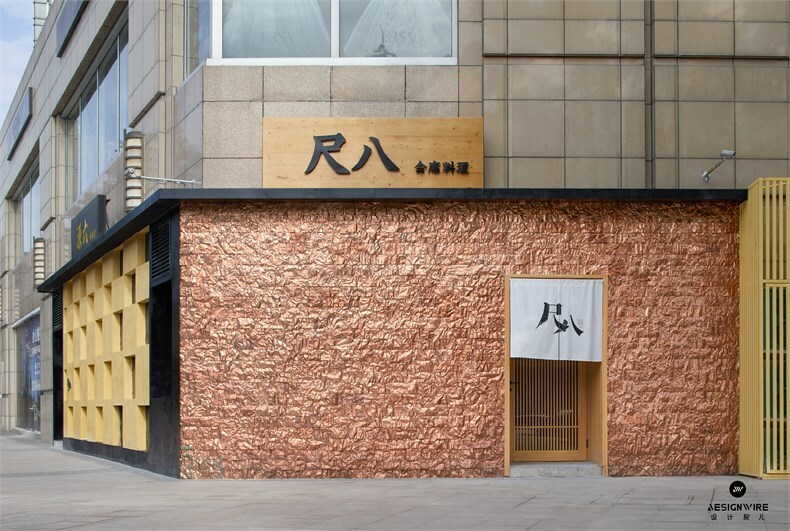 Above all, the aging of the copper can be enjoyed for a long time, in the consumption society where the life span of shop interior will be often very short, we hope this project has durability as it won’t be easily consumed.